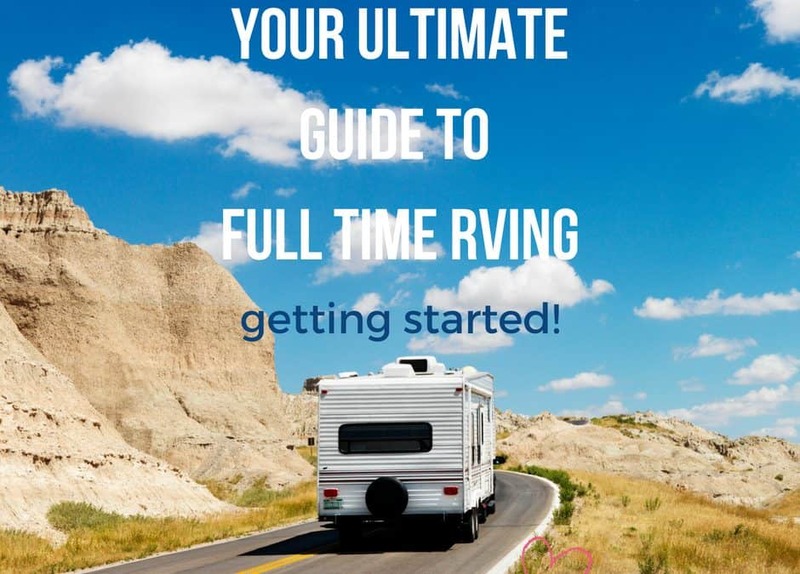 Home » Blog » Simple Living » RV Life » Your Ultimate Guide to Full Time RVing! 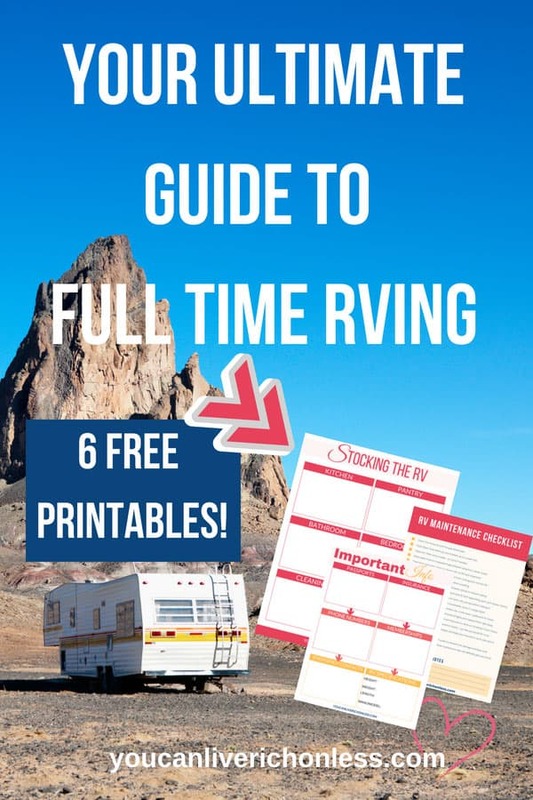 This post will share my experiences, and those of other full-timers on the steps that are necessary to make the transition from a house to full time RVing! 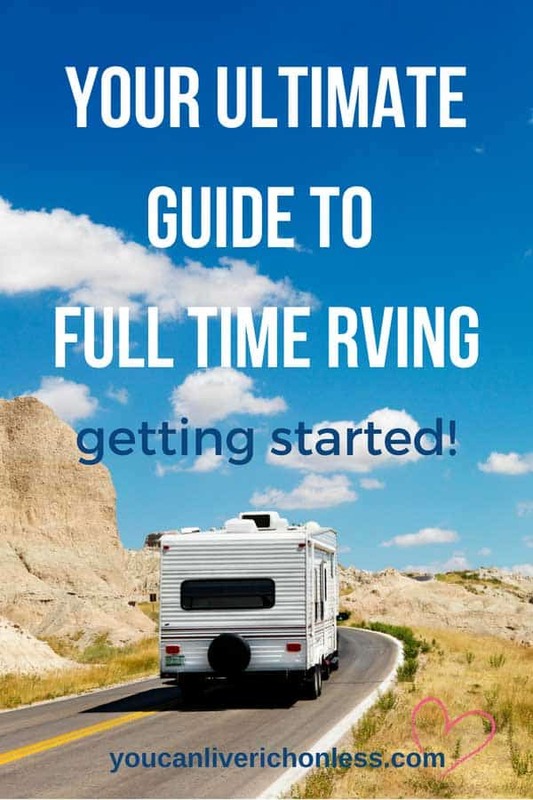 Also, the guide starts after you have decided to sell your home or sublet and have chosen your new RV home! At the end of the post I’ve listed a number of resources for you to check out to help you with those decisions. And since there is so much information in this post you may want to save it as a PDF for later! Or an apartment to sublet? What type of RV do you want to live in? A travel trailer, like an ultralight or 5th wheel? These are the fun decisions, going to RV shows, researching on the internet, checking out the facebook groups, figuring out what it will cost! If you live in a house chances are you have acquired lots and lots of stuff! I know, I feel your pain. For us we had an entire basement, and four bedroom home full of stuff. Oh and did I mention the loft in the garage? No? Well that too. The decluttering and organization experts tell us that to get rid of our stuff we need a number of piles – to sort everything into. Each category has its own coloured post it note. How we survived all this time without post-its I have no idea. But I digress. Sounds easy right? Well for us, this was the most painful part of the process. Let me explain. We used a number of different ways to sell stuff – ebay, Craiglist, privately through friends and of course the tried and true Yard Sale or Tag Sale as some might call it. Deciding what to sell wasn’t the hard part. It was seeing it sell for mere pennies on the dollar. All that money we had spent on a snowblower, small trailer, shelving for the garage, overhead travel bin for the car. So please be prepared, and be ready that this will happen to you too. We left our tag sale until late in the process – only two weeks before closing on the sale of our house. So we really had to get rid of it all. No need for a snowblower, no place to put that beautiful wicker patio set we bought for the oversized deck on our oversized house. You get the picture right? Now lots of furniture and big ticket items just didn’t sell, so we decided to donate it to local charities. They are always so grateful, and this helps people in need so it really did take the sting out of the lost $$. Put into storage for the future. The heirlooms and treasures again, that was the easy part. It was the treasures we had accumulated as a family over the years. In our case it was the art work we had collected during our travels. I could not part with it. I just couldn’t. So we had a small amount of items that store either in the storage shed in the park, or in a regular storage locker, all well wrapped so that the elements can’t hurt them. Someday you will leave the open road, and want this stuff, and it will be there waiting for you. I figured that the low $$ per month storage was well worth the peace of mind. Usually the smallest locker you can rent is 10x10 so keep that in mind. Kitchen items like a slow-cooker, small pressure cooker and toaster oven are great assets to any RV kitchen! Most RVs have a microwave and there are lots of awesome recipes you can make, and bake! It doesn’t have to be all BBQ! I recommend two sets of sheets, pillowcases and blankets, so that when one needs to be washed, you have a second set. The same with towels. Everything else give away. Clothing fits into this category, and usually kitchen equipment, bedding and towels. There is only so much room in an RV for everything, so you need to prioritize. You might have friends whose kids are setting up their first apartment or going to college. This section also includes dry and canned goods that you won’t be able to use that aren’t expired. Pack up the car and make a trip to your local food bank. They will receive them gratefully. Post a note to all your friends on facebook and let them know that if it isn’t picked up by a specific time and date, it’s going to get pitched. I think we are collectors by nature. If you are a Costco shopper or keep a large pantry of dry and canned goods in your basement, check the expiry dates. Chances are that great deal on salad dressing didn’t get used up. I still have 12 bottles of toilet bowl cleaner, but there ya go. Items that are still good that you can’t fit into the RV are great items to drop off at your local food bank. Everything else gets boxed up and taken to the landfill. You need to keep in mind how they will receive certain items, like electronics and other recyclables. We were given a coupon by our realtor for a local company that hauled everything away for you for a flat fee. We were down to the wire by that time, I think the house closed the next day, so it was a lifesaver! This is a big one, and we thought we had it covered, but alas didn’t. If you buy a used RV, then make sure it is road ready and safe. To read about our early experience and a cautionary tale, click here to read our post on RV Tire Maintenance. If this is your first rodeo take the time to meet with the RV dealer, or former owner. Have them take you through the basics, like how to hook up the sewer hose pipe, where the black and grey water valves are, and how to dump the holding tanks. A huge set of heavy rubber gloves is a good investment for this chore! Most RVs (new and used) come with a stack of warranty and User guides – everything from the floor to the roof vents. Be sure to keep this in a place where you can find it at a moment’s notice. Better still, set up a three ring binder and file it all by product. This will save you so much time, and when we travelled we referred to our warranties and User Guides many many times. Insurance and Roadside Assistance round up this section. Insurance on your RV as well as your vehicle – they are not one and the same. Choose a deductible that your budget will stand. I’m not an insurance expert by any means, but of course like your car insurance, the higher the deductible, the less you will pay in premiums. We highly recommend Good Sam Roadside Assistance. They are the gold standard in my opinion, and helped out of some really difficult situations. Don’t skimp on this. Have it all set up before you leave. While hitting the open road, and living full time in an RV appeals to the romantics in all of us, there are definitely adjustments you need to make. You need to be ready for a lot of togetherness. This is small space living at its finest, some call it glamping! There is no spare bedroom to get up and go to when your partner is snoring. But the sound of rain on the roof of your RV when you are all snug and cozy inside is blissful. RV Living requires some planning too. Like laundry days, when to restock on groceries, travel time and having fun! Be prepared for the naysayers too. Family and friends just may not understand why your leaving your jobs, selling your house and embracing the full time RV lifestyle. I’m sure our family doesn’t quite understand it yet, even 4 years later! For some there is even a negative connotation for living in an RV or trailer. But people have their own built-in beliefs and prejudices. You can’t change that. Hopefully they will see how happy and balanced your life is and they will want to try RV living too! Seriously, all you can do is reassure them that you haven’t lost your mind, and that you will send them photos of your travels. And with the technology we have today, you can stay in touch anytime you can find a WIFI signal. 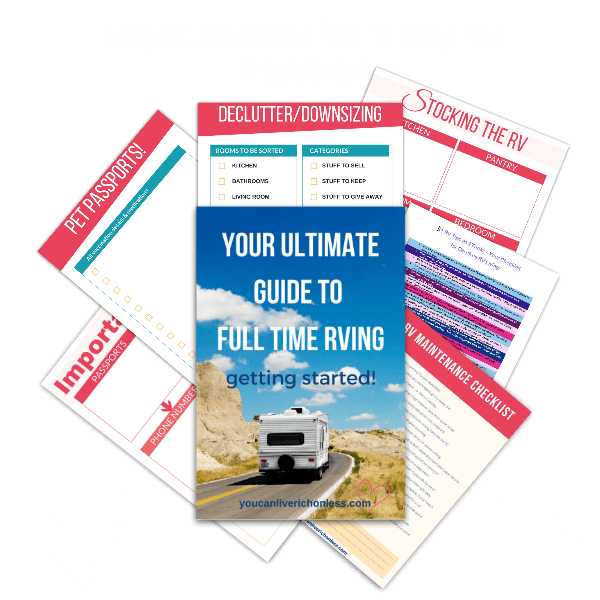 Shopping is a good thing anytime, so as you have been getting rid of stuff, there are certain things that you just won’t have that are necessary to full time RV living. Measure your kitchen space, and closets to see what will and what won’t fit. Places like Amazon and Camping World are great resources for new stuff. There is now a need for 1 ply toilet paper for example. That thick ultra-soft 3 ply stuff you used at home just won’t work in an RV. Oh you can use it, but the first time you have a plugged sewer hose, you’ll never use it again! Here are some RV Tips and Tricks that I wanted to share. These are things that we have learned from personal experience. 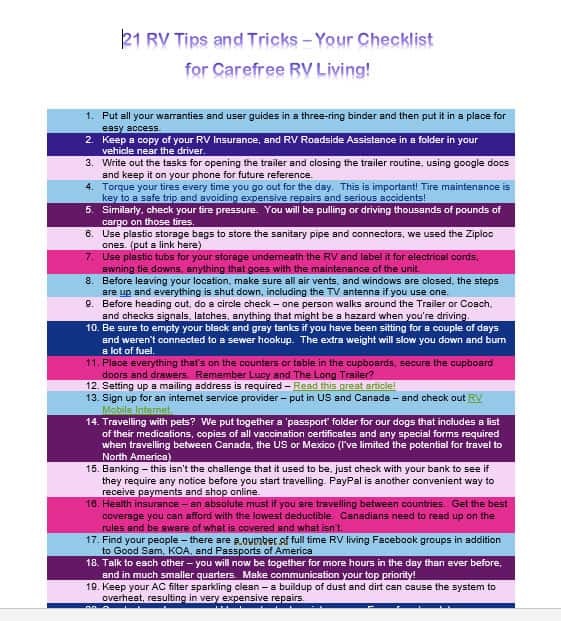 21 RV Tips and Tricks – Your Checklist for Carefree RV Living! You can download these printables here! 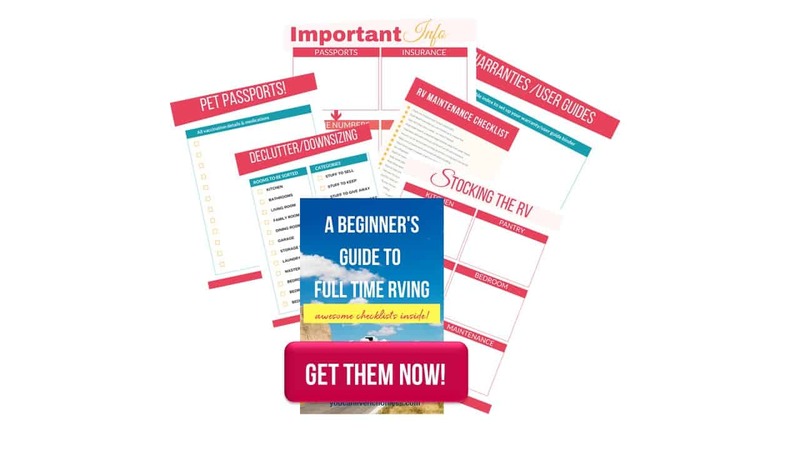 Gee Judy, that’s a huge list, and now I don’t even know whether or not I want to live in an RV full time! What gives? 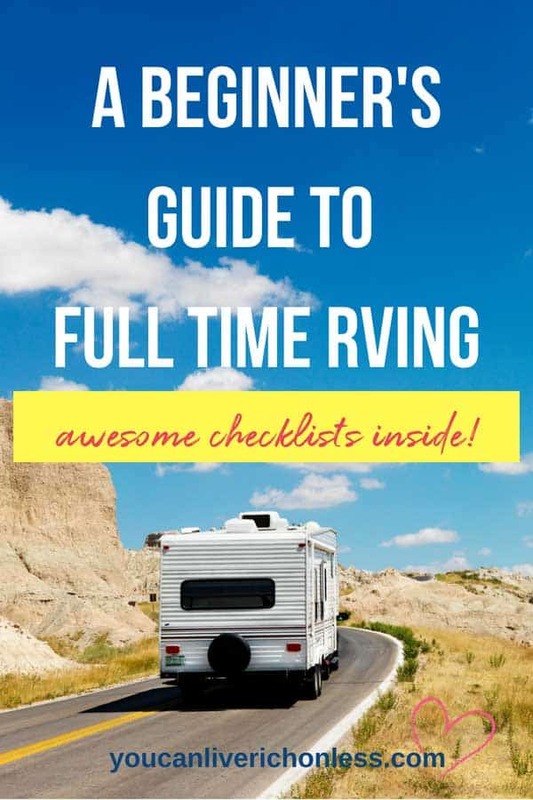 Transitioning from a house to full time RV living is a major lifestyle change. We jumped into it feet first, but we had some idea of what life would be like since we had an RV for recreation for a couple of years. You may want to do that, and get your feet wet first. Far be it from me to dissuade your eagerness to adapt this awesome lifestyle though. I know of lots of people who just went for it and learned by doing and living. That’s ok too. I just wanted you to have some preparation, learn from our mistakes, and hopefully save some money too! We have absolutely no regrets, and I’m still hopeful that there is a class A motorhome in our future for us to travel in during the winter months. There’s so much to see yet before I want to settle into one place. And I’m not looking at a motorhome that costs a bazillion dollars either. Our neighbor next door has an awesome 1994 Class A he bought for $25,000 (CAD)! Those deals are still out. So hopefully I can convince my sweetie that this will be our next big adventure…. I promised you some resources. There are tons of websites that will help you answer these questions, and even more facebook groups! Here is a list to get you started.